It is important to dismiss some fallacies surrounding the recent Gaza war before we examine the significance and fallout of Israel’s eight-day bombing campaign. One is that Hamas started the fighting by firing hundreds of rockets into Israel, the other that Israel was targeting “terrorists.” A careful analysis of the sequence of events leading to Israeli bombardment proves the former to be untrue. The latter fails scrutiny in view of available reports and casualty figures released by the Palestinian Centre for Human Rights based in Gaza City. The vast majority of the more than 150 killed and 1000 injured were civilians, though the Israelis claimed the opposite. President Mohamed Morsi of Egypt was widely credited for playing a key role in negotiating the truce between Israel and Hamas. Riding the crest of popularity, Morsi immediately issued a presidential decree giving himself sweeping powers which would be impossible to challenge. He appointed a prosecutor-general of his choice, granted the Constituent Assembly and the Shura Council, the upper consultative house of parliament, protection from dissolution by the judiciary. He also ordered the retrial of Mubarak-era officials who were accused of killing and injuring protestors during and after the Tahrir Square demonstrations last year. The presidential decree has stunned the population and sparked a fierce debate in the country. Supporters have hailed it as “revolutionary.” Opponents have condemned it as a “coup.” From now on, all presidential declarations, laws and decrees will be immune to appeal “by any way or by any entity.” There now exists a climate of anger and frustration in Cairo and other cities. Judges, liberals and secularist politicians and activists outside the Muslim Brotherhood circle are furious and offices of Morsi’s party have been ransacked. On the BBC’s Today program on November 23, Fawaz Gerges, a leading Middle East expert at the London School of Economics, compared President Morsi’s move with Gamal Abdel Nasser’s “power grab” in the 1950s, paving the way for dictatorial rule under Nasser, Anwar Sadat and Hosni Mubarak. Professor Gerges warned of a “dangerous” situation in the country. For a while it had looked as though Egypt under Morsi would retake its role as the most powerful and effective Arab nation in the Middle East. However, his move to grant himself sweeping powers has upset the delicate political balance in the post-Mubarak era. For Egypt without internal stability cannot play its proper role in the region and beyond. The roots of conflict in the territory called Palestine are as ancient as an interested party would profess. But claims that Hamas rockets began the latest Gaza war are false. The blockade, the humiliation of Palestinians who must pass through the Israeli crossings regularly, the Israeli army’s incursions and rockets from Gaza are part of everyday life. What appears to be true is that for about two weeks there had been a lull, broken on November 8 when Israeli soldiers entered Gaza. In the ensuing fighting a 12-year-old Palestinian boy playing soccer was killed. In retaliation, Palestinian fighters blew up a tunnel along the Gaza-Israel frontier injuring one Israeli soldier, followed by the firing of an anti-tank missile which wounded four Israeli troops. On the same day, an Israeli tank shell landed in a field killing two teenagers. Thereafter, an Israeli tank fired on a funeral. Two more Palestinians were killed and many more injured. 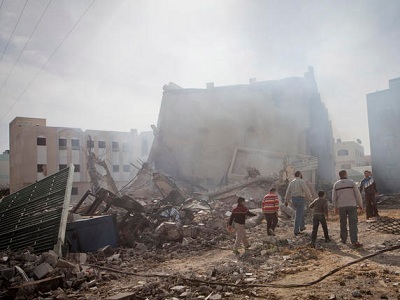 On November 12, Palestinian factions offered a truce provided Israel ended its attacks. Two days later, the Israelis assassinated Ahmed Jabari, the Hamas military chief, and at least eight others, including two Palestinian children. It was this sequence which triggered the war. Was it self-defense on Israel’s part, or provocation? The Israeli Prime Minister Benjamin Netanyahu has been itching for war with Iran in recent years. He may have succeeded in launching a military campaign which could lead to a broader Middle East conflict but for President Obama’s reluctance to go down that route. This is why Netanyahu wanted a victory for his friend Mitt Romney, who appeared eager to take military action against Iran and its allies, Hezbollah and Hamas. President Obama’s opposition, Romney’s failure to win the American presidency and serious doubts from influential voices within Israel’s own military and political establishment thwarted Netanyahu’s ambition to attack Iran for the time being. But Netanyahu was not happy with his present grip on power. He would like to strengthen it further and for that he called fresh elections. A war would show him to be Israel’s “strong man,” improve Likud’s election prospects and a win would give him a longer period in office. However, those who play the game of Russian roulette must be ready for unexpected consequences. In the aftermath of another Gaza war, two realities confront each other. On one hand, Israel’s bombardment of Gaza has taken the lives of more than 150 Palestinians, many of them innocent civilians, for a handful of Israeli lives. Netanyahu can continue to display hubris; his offensive in Gaza may improve his prospects in the coming elections, or may not; and President Obama has to go on expressing public support for Israel, though his private views may be different. On the other hand, Hamas rockets of Iranian design have travelled longer distances than before; though still crude and incapable of precisely targeting anything, they are enough to cause more alarm in Israel than before; Hezbollah has shown that its drones can fly over Israel now; and the movement’s leader Hasan Nasrullah openly taunts the Israelis and the Americans in his speeches. One side, all powerful, is struck by fear and paranoia. The other, armed with primitive rockets, professes its willingness to make whatever sacrifice there is to be made. No ceasefire can last. – Deepak Tripathi, a writer on the Middle East and U.S. foreign policy, is the author of Breeding Ground: Afghanistan and the Origins of Islamist Terrorism (2011) and Overcoming the Bush Legacy in Iraq and Afghanistan (2010), published by Potomac Books, Inc., Washington, D.C. His works can be found at: http://deepaktripathi.wordpress.com. He contributed this article to PalestineChronicle.com. Contact him at: deepak.tripathi.writer@gmail.com.